Two goats were seen running on the subway tracks in Brooklyn Monday morning. Rana Novini reports. Goats have to commute, too. Two goats were spotted roaming on the above-ground N tracks near Green-Wood Cemetery in Brooklyn Monday morning, and after about an hour, the MTA said it had to reroute trains on the line so cops could safely catch them. The MTA says it called NYPD and Animal Control about the goats, who were on the tracks between the Fort Hamilton and New Utrecht stations, before 11 a.m. By 12:30 p.m., the goats were still on the tracks. They were surrounded. Transit officials tweeted a picture of the black and white goats, captioning it, "Two very baaaaaad boys." N trains were running on the D line in both directions from 36 Street to Coney Island as crews worked to corral them. They were tranquilized a short time later and have been taken to the Farm Sanctuary in Watkins Glen, New York, with the help of comedian Jon Stewart, who has a history of bringing rescued animals to that farm. Comedian Jon Stewart picked up the two goats found roaming along subway tracks in Brooklyn Monday morning from the Animal Care & Control of Brooklyn, and transported them to the Farm Sanctuary in Watkins Glen, N.Y. 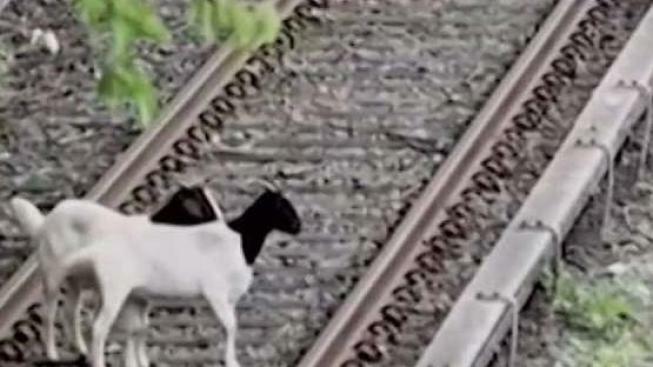 It's not clear how the goats got on the tracks, nor where they came from, but it is the third recent incident in a nationwide goat-on-the-lam trend. 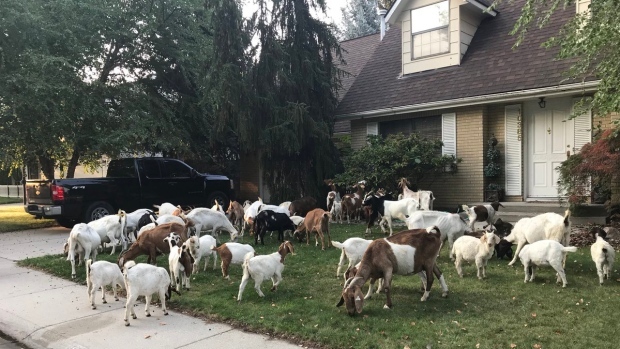 First, more than 100 goats ran amok in an Idaho neighborhood, eating everything in sight. Less than two weeks ago, 75 goats (and sheep) escaped a New Jersey livestock auction and went wandering around Hackettstown. In that case, it appeared someone may have left a gate unsecured.